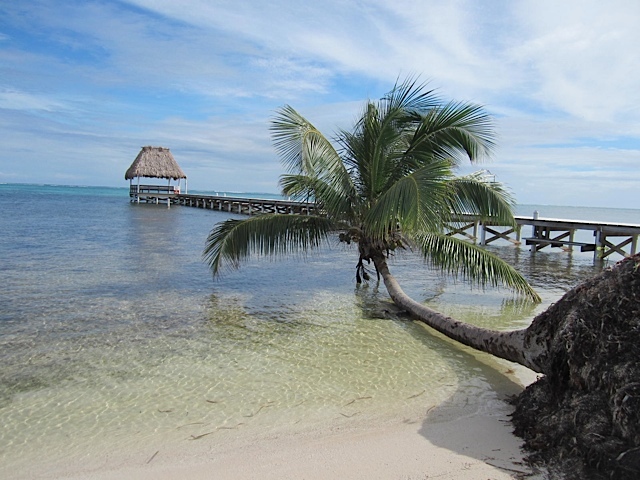 Ambergris Caye is one of the largest, most visited islands in Belize. Most adults visit the island for the incredible diving and snorkeling that the Belize Barrier Reef offers, but what about activities for children, especially little kids? We’ve have lived here for 2 months with our 3 and 1 year old and have a few ideas of what to do with kids on Ambergris Caye. Many of these activities revolve around water, after-all, this is an island. Snorkeling in Belize is awesome! The variety of colorful fish and underwater creatures along the reef is extraordinary and the color of the water is mesmerizing. Even if kids don’t want to stick their face in the water, taking them along on a snorkel expedition can still be fun and entertaining. The water is so clear, that they’ll be able to see the bigger species of fish, sharks and stingrays from the boat. 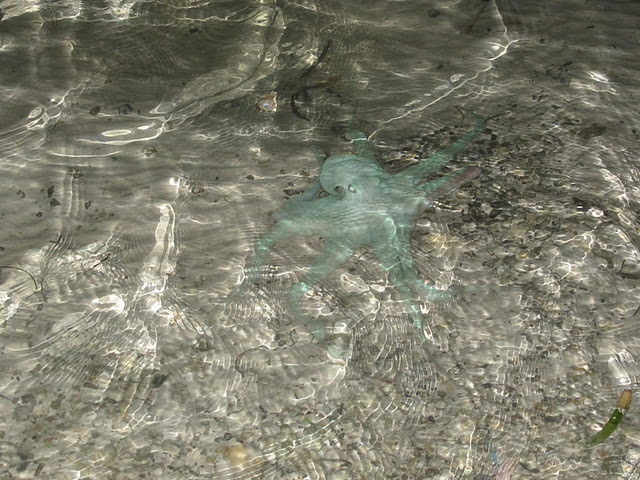 Most snorkel tours go to Hol Chan Marine Reserve, which is the best area to see lots of variety of fish, eels & turtles. Our 1 yr old loved just being on the boat, it was a new place with a lot of interesting things to touch and play with. Our 3 yr old was able to snorkel, well, more like float, along side with us in his life jacket, and he loved it. The tours also go to Shark Ray Alley where we fed the sharks sardines and then we all jumped into the water to swim with them. Our guide brought over a shark and a stingray so we could feel its skin. Older kids will have even more fun on a snorkel tour of the reef since they are capable of swimming and snorkeling on their own. 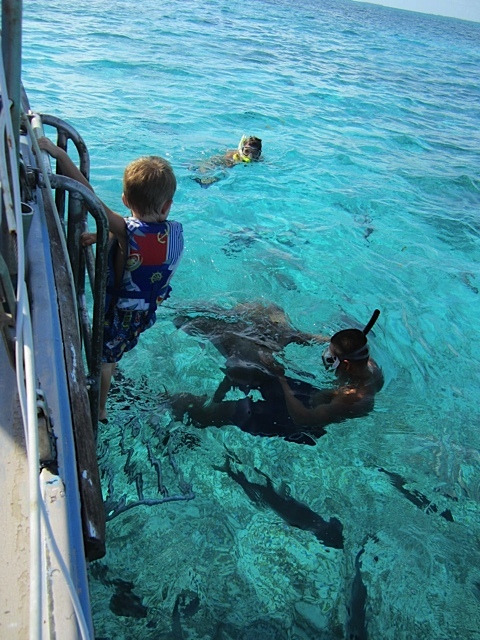 In our opinion, when visiting Ambergris Caye, snorkeling at Hol Chan Marine Reserve and Shark Ray Alley is a must do for every adult or child! Read and see more pictures of our experience snorkeling in Belize. I’m a bit of a kayak nut and have turned kayaking into a fun family activity that I do with my 3 yr old G. He loves coming with me, and although he says he’s going to paddle, usually I end up being the only paddler while he looks to the horizon for dolphins and fish jumping out of the water. At this age, kayaking only entertains him for about half an hour, but I still enjoy my time with him talking, laughing and jokingly urging him to paddle. The waters near Ambergris Caye are so many shades of blue that it is fun paddling from one shade to the next, looking down to see marine life and pointing out where we live from different areas of the ocean. With older kids, kayaking can be a nice half day adventure with several fun stopping points, perhaps to the reef for a snorkel, to a restaurant on the water for lunch or kayaking around some of the beautiful boats anchored in the waters. 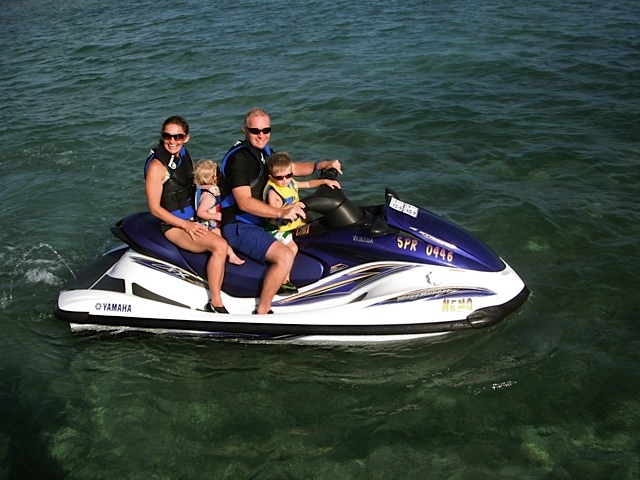 You may think we’re crazy for taking a 3 & 1 yr old out on a jet ski, but let me assure you that these powerful machines are steady and safe when used properly and a whole lot of fun! The calm waters around the island provide for a smooth ride. Our entire family fit on one jet ski. With our little one sandwiched in between us, we headed out for a half hour of speed and splashes. The view of the island from the water is great, but we had the most fun following a Spotted Eagle Ray swimming in the water. There is no shortage of docks in San Pedro and all of them are open to the public from the hours of 6 am-6 pm. 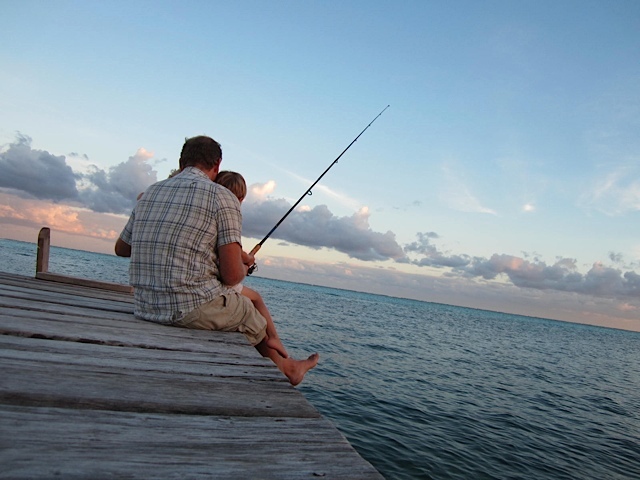 This makes for a quick and easy fishing trip right off the end of the nearest dock. The fish are plentiful that just a fishing line and some bait will more than likely get you a nice snapper. This is great for the young ones because you can be out there as long as their patience will allow. We have managed to catch a nice sized bone fish on our first time out, but most of the time we have our bait nibbled of our hook and end up just feeding the fish. We say we are fattening them up for when we do catch them. Our 3 year old loves to reel in the line and our 1 year old loves just playing with the bait. Ambergris Caye is nothing short of a water paradise for young and old. The above is a short list of 5 things to do with children on Ambergris Caye, but it certainly isn’t all that is available. This little island is a magical place for children and can create lifelong family memories. Can you imagine the fun kids would have playing here? Hope you liked the shortlist! Now that you have discovered great activities on Ambergris Caye for kids, start clicking on the links below to read about other great places around the globe for children!